B.C. : Who should cover search and rescue costs? Your browser does not support frames. <a href="http://globalnews.ca/video/1055198/who-should-cover-search-and-rescue-costs" data-mce-href="http://globalnews.ca/video/1055198/who-should-cover-search-and-rescue-costs">Click here to view the frameless video.</a>. Mon, Dec 30: Search and rescue crews face challenging conditions when they go in search of people who have run into trouble on the local mountains. That frustration peaks when skiers and snowboarders choose to go out of bounds. And once again raising the debate about who should foot the bill. A woman who went missing in the Rogue River Highway area Friday morning has been found safe and sound. The Grants Pass Department of Public Safety began searching for 43-year-old Camala Ruth Cobbs around 11:00 a.m. Friday after her boyfriend called authorities. The previous night Cobbs admitted herself to Three Rivers Medical Center and she was going to meet her boyfriend at Herb’s La Casita at 9:00 a.m. but when he arrived at the restuarant there was no sign of her and her car was found idling on scene. Family members of Cobbs contacted authorities Sunday morning and they were able to locate her safe at a friend’s house in the northwest section of town. Giovanni Demartino, 22, and Danie Fournier, 23, are lucky to be alive. 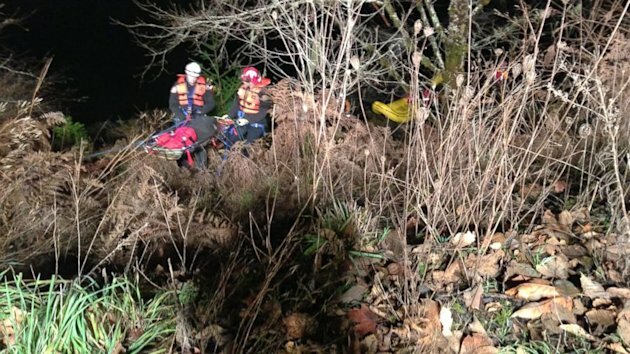 Their car fell 30-feet onto the edge of an embankment and then tumbled another 15 feet, landing upside down in Oregon's rapidly flowing Molalla River early Sunday morning, according to Lt. Byron Wakefield of the Molalla Fire Department. The car was almost completely submerged. Demartino, who was driving, remains in critical condition, while Fournier is in stable condition. The couple managed to get out of the vehicle - which had filled with about 6 feet of water - before several good Samaritans and rescue personnel arrived at the scene. "One guy was hanging onto the bumper and the other [person] had swum downstream," Wakefield told ABC News. People driving behind the crashed vehicle flagged down another car for assistance before stepping in to help themselves. "Crews arriving found two men on top of the vehicle in the water. One of the males was the driver who was pulled from the water by a male who was not involved in the crash," according to a statement from the Clackamas County Sheriff's Office. Those who'd seen the car tumble located Fournier, who had swum to shore on the other side of the river. About 35 rescue personnel from six different rescue agencies preformed a high and low angle rescue for the couple, who were then transported to the Oregon Health and Science University hospital. "Alcohol is believed to have been a factor in this crash," according to the sheriff's office. "The case has been forwarded to the Clackamas County District Attorney's Office for charges of Driving Under the Influence of Intoxicants and Assault." When a day of Colorado skiing last week turned perilous due to an avalanche, Edwin LaMair had his younger brother to thank for pulling him out of a potentially life-threatening situation. Edwin, 22, and Davis LeMair, 19, were skiing with friend Jack Edgar on a backcountry trail in Vail on Dec. 22 when an avalanche engulfed Edwin, burying him up to his head. After a few minutes of reduced visibility following the slide, Davis was able to spot his brother and quickly skied over to help him. 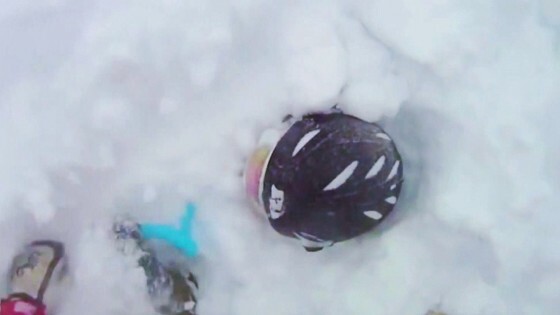 He found Edwin almost completely submerged under the snow and struggling to breathe, which was all captured on a GoPro camera mounted on Davis’s helmet. Edwin escaped with only a knee injury, and will have surgery later this week to repair a torn ACL and MCL that will keep him out of action on the slopes until the next ski season. He also was lucky because the avalanche occurred close to 4 p.m., so there was enough daylight left for Davis to be able to spot him. “We were lucky that they were able to find me and my head was above before it got dark, because if they had to search for me in the dark, it could’ve been a bad situation,’’ Edwin told guest TODAY anchor Bryant Gumbel. Edwin LaMair was buried up to his head in snow. The brothers and friend Jack Edgar are certified in avalanche safety and were carrying avalanche probes, beacons, shovels and other gear. They also had AvaLungs, which allow users to breathe for 30 minutes while trapped under snow, but the force of the avalanche ripped it out of Edwin’s mouth before he could apply it. The brothers had checked with the avalanche center before they went up on the mountain and said the forecast for a potential avalanche was a 2 on a scale of 5. They also tested their avalanche beacons before making the run. “I’ll have his back any time we’re doing any backcountry activity or anything in the mountains, and I’ll always be looking out for him just like he did for me,’’ Edwin said. Two hikers who triggered an avalanche on Mount Washington that carried them 800 feet over rocks, cliffs and ice were rescued early Sunday morning and treated for non-life-threatening injuries, officials said. The two were separated from a pair of fellow hikers and missed a turn on a trail because of low visibility and unknowingly entered an avalanche area known as "the Lip," triggering the avalanche that carried them to the bottom of Tuckerman Ravine, said U.S. Forest Service spokeswoman Colleen Mainville. Mainville said the avalanche occurred at about 5:30 p.m. Saturday and the call for help came in just after 8 p.m. The injured and disoriented hikers climbed about 200 feet before they were met by rescuers and they were able to hike down with assistance to shelters on the mountain, Mainville said. They were transported by a U.S. Forest Service snow cat to awaiting ambulances at about 2 a.m. Sunday. Mainville said she doesn't know whether they were admitted to the hospital, but she said they were treated on the mountain for bumps and bruises and one appeared to have a fractured arm. White Mountain National Forest officials are not releasing the hikers' names. "They were very, very lucky," Mainville said Sunday, describing it as a very difficult and dangerous rescue mission. At least three hikers have been killed in Tuckerman Ravine — a popular, but challenging 4.2-mile trail where large ice cliffs form in the fall and winter — since the start of 2012. In September, a 25-year-old Canadian hiker died after he slipped and fell 150 feet while descending the trail. In April 2012, a 67-year-old Boston man lost his footing and fell hundreds of feet into a crevasse while hiking with his son. His body wasn't recovered until a month later. Another Massachusetts hiker died after falling 800 feet there in January 2012. The Mount Washington Avalanche Center had reported in its avalanche advisory posted on its website Saturday morning that there was a considerable avalanche danger in "the Lip" area of the ravine, noting that human triggered avalanches "are likely." It warned hikers that "safe travel in avalanche terrain requires training and experience." Sunday's advisory said that there was a moderate and low avalanche danger in Tuckerman Ravine and that human triggered avalanches were possible. Mainville said a half dozen organizations participated in the overnight rescue, including White Mountain National Forest snow rangers and volunteers from the International Mountain Climbing School, the Mountain Rescue Service of North Conway, Appalachian Mountain Club, Harvard Mountaineering Club and Androscoggin Valley Search and Rescue. The search for missing British tourist Tom Billings has been wrapped up now after getting re-activated following a social media tip about a possible sighting last month. Tim Jones with North Shore Rescue says they received a tip that two female hikers may have seen Billings in the Lynn Headwaters area on November 25. If weater permits, NSR plans to conduct another aerial search Sunday of the Lynn Headwaters area after scouring the Hanes Valley area last night. On Friday, NSR released three videos of their search at Grouse Mountain and Lynn Headwaters in hopes the public may be able to capture and report something that may assist in locating Billings. One of the hikers saw a Tweet mentioning the videos, which jogged her memory about the sighting. The tip resulted in the re-activation of the search at the request of Vancouver Police and North Vancouver RCMP. Randy Fincham with Vancouver police confirmed to Global News they are continuing their search for the missing tourist. “As tips are received, the Vancouver Police will continue to utilize partnerships with outside agencies, including North Shore Search and Rescue, to ensure that those tips are followed up by experts in the field,” says Fincham. Jones says the search has now been authorized by Emergency Management B.C. “We have to be very careful in saying that this is a possible sighting, but this is very credible information,” says Jones. “We have the direction of travel. We feel that he is somewhere in the Haines Valley/ Crown Creek area, and our intent is to get our members into that drainage tomorrow.” Jones says it would be an absolute miracle to find Billings alive. “The survivability is almost nil at this time,” says Jones. North Shore Rescue are planning one more major search next weekend. The Billings family is paying for the search effort. Earlier this month, Billings’ father travelled all the way to Vancouver from the U.K. and made an emotional plea for any tips that would lead to his son’s return. Twenty-two-year-old Thomas Billings went missing on November 25 and was last seen in the 1400-block of East Broadway. He was supposed to go to the U.S. at the end of the month, and return to England on Dec. 7. Billings was known to hike when he travelled. His family says he is a very experienced hiker and he has hiked all over the world. Billings is described as white, 5’7” tall, 160 lbs., with blonde short hair and blue eyes. He was last seen wearing a black jacket and grey military style pants. Anyone with information on the disappearance of Tom Billings is asked to call the Vancouver Police Department. Two leaders in the field of search and rescue have stated that it won't be long before satellite imaging is all part of the matrix when a sailing boat sounds an alarm or goes missing in the ocean - and this could make all the difference. In the news recently are two incidents to which this could apply - one fictional, one all too tragically real. In the film 'All is Lost', Robert Redford, sailing solo seventeen hundred miles off the Sumatran Straits, is hit by a drifting sea-land cargo container. Although Redford manages to make three SOS calls, he’s soon forced to abandon ship. While the causes of a real tragedy at sea - the demise of the Nina in the Tasman Sea - may never be known, something just as catastrophic may have happened to this fully-crewed, 70-foot American schooner. But in such rare cases when all emergency communications fail, satellite imaging could now make the crucial search and rescue difference. Nina in happier days - .. . The story is well-known to Sail-World readers. With seven aboard, including six Americans, the Nina’s last confirmed, but undelivered satellite phone text message, stated that that the schooner had had its storm sails stripped away and was encountering 110 km/hour wind gusts and 8-meter ocean swells. By then, the craft was estimated to be some 370 nautical miles West-North-West of Cape Reinga in the Tasman Sea, between Newcastle, Australia and Opua, New Zealand. However, Maritime New Zealand’s Rescue Coordination Centre officially suspended its search after 12 days, which included covering some 737,000 sq. nautical miles with a Royal New Zealand Air Force P-3 Orion aircraft. Meanwhile, friends and families of Nina’s missing crew contacted DigitalGlobe DGI +0.85%. The U.S.-based satellite operator readily agreed to reposition its constellation of commercial satellites to collect high-resolution imagery of almost 500,000 square kilometers — an area larger than California. DigitalGlobe then used its recently-acquired Tomnod crowdsourcing online platform to aid in the search. DigitalGlobe recruited thousands of online users to help sift through massive amounts of sat-photo images and tag anything that might look like the missing craft or its life raft. An image taken September 16th by DigitalGlobe’s QuickBird satellite was flagged as potentially being the missing yacht by multiple Tomnod users. The image was then sent to Maritime New Zealand where it was thoroughly analysed in terms of whether it would 'constitute sufficiently-compelling new information to resume active searching,' says Nigel Clifford, Maritime New Zealand’s General Manager for Safety and Response services, which oversaw search and rescue for the Nina. It was then determined, says Clifford, that the QuickBird photo isn’t likely to contain an image of the missing yacht. 'But given the elapsed time, survival under this scenario is most unlikely,' said Clifford. Sadly, by the time the images were seen by potential rescuers, the target would have drifted far from the sighted position. Clifford notes that analytical image analysis technology has to be both highly effective and fast enough to beat the clock. 'All is Lost' only reinforces just how difficult open ocean search and rescue can be. Redford’s full-sized life raft passes within half a mile of two large cargo ships and even with flares still can’t get their attention. Glickman says as long as the craft is still on the surface, by knowing its dimensions and the satellite that imaged it, analysts could quickly compute how the vessel would appear from low earth orbit. He adds that because satellite images are registered with geospatial coordinates, in principle, search agencies using them should then have precise new location data to work with. Maybe not very effective today, but in the near future satellite imaging could be one more standard tool used by the search and rescue organisation searching for lost sailors. MULTNOMAH COUNTY, OR -A Portland teenager who was the focus of an all-night search at a popular hiking destination in the gorge has been located. Multnomah County Search and Rescue teams comprised of about 30 people searched all night around Horsetail Falls for 16-year-old Alex Irvin. Alex, whom authorities say has moderate to severe autism, became separated from his family just before 5 p.m. Saturday. Police said Alex was found this morning at a remote, hard-to-reach getaway called Nesika Lodge. It's about five miles away from the trail head where the searchers staged a command post. According to Oregon Wild, Nesika Lodge stands about 1800 feet above the Columbia River. There is no marked trail to the destination, and the terrain to get there is relatively difficult. It's unclear if anyone was at the lodge when Alex arrived. His condition was unknown. Officials said the teen didn't have a flashlight, cell phone, food, water, or any other emergency items. Temperatures overnight dropped into the 20's as search crews worked their way repeatedly up and down the slick and rocky trails in hopes of connecting with Alex. During the overnight operation, an Oregon National Guard helicopter was brought in for an aerial search using specialized camera equipment. MULTNOMAH COUNTY, OR -Search crews are desperately trying to find a Portland teenager who disappeared late Saturday afternoon at a popular hiking destination in the gorge. Alex, whom authorities say has moderate to severe autism, became separated from his family and didn't show up at the trail head just before 5 p.m. Saturday. Officials said the teen didn't have a flashlight, cell phone, food, water, or any other emergency items. Temperatures overnight dropped into the 20's as search crews worked their way repeatedly up and down the slick and rocky trails in hopes of connecting with Alex. During the overnight operation, an Oregon National Guard helicopter was brought in for an aerial search using specialized camera equipment, but the effort was unsuccessful. The helicopter is expected to return later today if needed. Meanwhile, authorities say teams on the ground will use search and rescue dogs as they continue combing the trails around Horsetail Falls and Oneonta Falls. The story will be updated as more information becomes available.